"816. 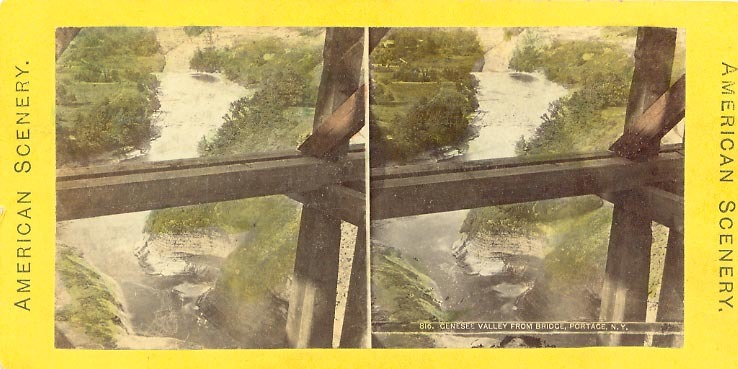 Genesee Valley from Bridge, Portage, N.Y."
Copyview, original probably by Pond. This hand tinted view was taken from inside the Wooden Bridge, probably from one of the walkways constructed for tourists. (See image 17). You are looking north, and far below you the Genesee River is tumbling over the Upper Falls. As you look down the Valley the River disappears over the brink of the Middle Falls. Can you pick out the part of the Glen Iris? Look in the upper left hand corner of the right image!